This article on Revolutionary War Timeline provides a full history timeline detailing the facts and information about famous people, important events and key dates of the American Revolutionary War in chronological order. 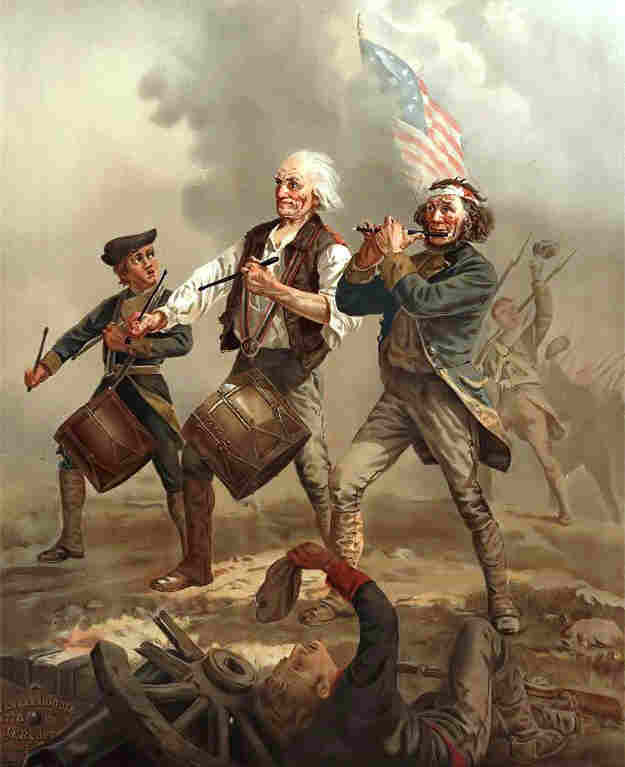 Fast facts about American history via the Revolutionary War Timeline. Important events in a fast date order format via the Revolutionary War Timeline. The Revolutionary War Timeline provides the sequence of important events, people and battles of the American War of Independence. The Revolutionary War Timeline covers the conflicts and battles fought during the American War of Independence. The American Revolutionary War Timeline covers the revolution of the American Colonies against Great Britain from 1775 to 1783. 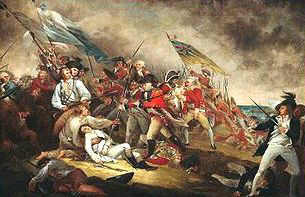 The following list of conflicts and battles include some of the most important events during the Revolutionary War. Discover interesting information and facts about the history of the US via the Revolutionary War Timeline. 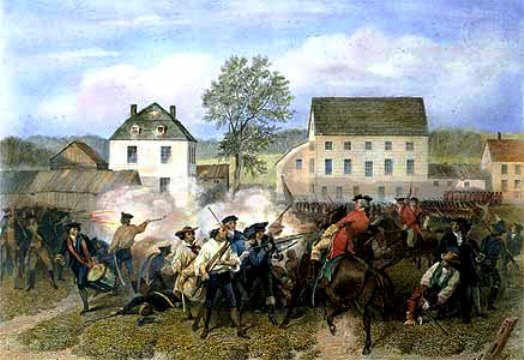 This article provides a Revolutionary War Timeline detailing the history, facts and information about the Revolutionary War with famous people, important events, conflicts, battles and key dates via this comprehensive Revolutionary War Timeline. Important events in history in a fast date order format via the Revolutionary War Timeline containing details of famous events and famous people who feature strongly in the history of America in this comprehensive Revolutionary War Timeline. The Revolutionary War Timeline provides the sequence of major events in American history - the American War of Independence. The Revolutionary War Timeline is divided into separate sections for easy reference. The Revolutionary War Timeline begins with the Provincial Congress in Massachusetts ordering 13,600 American soldiers to be mobilized and begin a year long siege of Boston. The conflicts and Battles that occurred during the 1775 Revolutionary War Timeline include the the first battle of the Revolution War at the Battle of Lexington, Battle of Concord and the Battle of Bunker Hill. 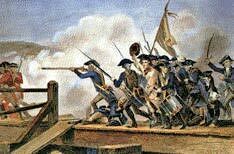 April 23, 1775 The Provincial Congress in Massachusetts orders 13,600 American soldiers to be mobilized and volunteers begin a year long Siege of Boston which is held by the British. 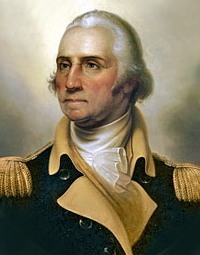 June 15, 1775 George Washington appointed general and commander-in-chief of the new Continental Army. July 6, 1775 Declaration on the Causes and Necessity of Taking Up Arms stating that Americans are "resolved to die free men rather than live as slaves. January, 1776 Thomas Paine's Common Sense published providing strong arguments for American independence. June 7, 1776 Richard Henry Lee presents a formal resolution to the Continental Congress for America to declare its independence from Britain. July 12, 1776 A huge British force under the command of General William Howe arrives in New York harbor to crush the American rebellion. The Revolutionary War Timeline is divided into separate sections for easy reference. The conflicts and Battles that occurred during the 1777 Revolutionary War Timeline include the Battle of Princeton, Battle of Bennington, Battle of Brandywine and the Battles of Saratoga. 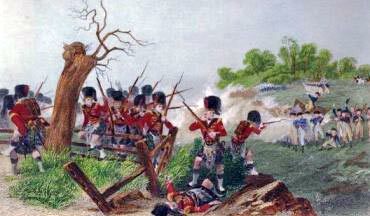 October 17, 1777 Americans capture Burgoyne and his army at Saratoga. November 15, 1777 Articles of Confederation - Congress is made sole authority of the new national government. The Revolutionary War Timeline is divided into separate sections for easy reference. 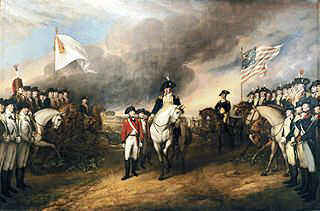 The conflicts and Battles that occurred during the 1778 Revolutionary War Timeline include the Battle of Monmouth and the British forces capture Savannah and Augusta at the Siege of Savannah. February 6, 1778 France signs a treaty of alliance with the United States and the American Revolution soon becomes a world war. March 16, 1778 A Peace Commission rejected by Congress. May 8, 1778 British General Henry Clinton replaces General Howe as commander of all British forces in the American colonies. May 30, 1778 Iroquois Indians burn Cobleskill, New York. 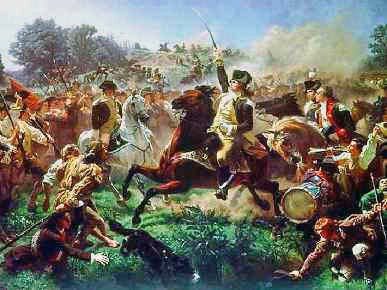 June 27-28, 1778 The Battle of Monmouth occurs in New Jersey as Washington's troops and General Clinton's troops fight to a standoff. July 10, 1778 France declares war against Britain. September 14, 1778 Benjamin Franklin appointed American representative in France. The Revolutionary War Timeline is divided into separate sections for easy reference. The conflicts and Battles that occurred during the 1779 Revolutionary War Timeline include The Siege of Savannah. April 1-30, 1779 In retaliation for Indian raids on colonial settlements, American troops from North Carolina and Virginia attack Chickamauga Indian villages in Tennessee. September 27, 1779 John Adams is appointed to negotiate peace with England. The Revolutionary War Timeline is divided into separate sections for easy reference. The conflicts and Battles that occurred during the 1780 Revolutionary War Timeline include the The Battle of Camden and the Siege of Charleston. The Revolutionary War Timeline is divided into separate sections for easy reference. The conflicts and Battles that occurred during the 1781 Revolutionary War Timeline include the Battle of Cowpens, Battle of Guilford Courthouse and the Battle of Yorktown. The Revolutionary War Timeline is divided into separate sections for easy reference. 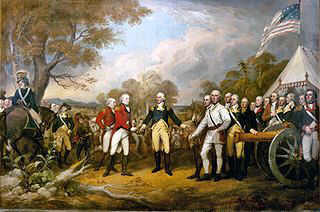 The conflicts and Battles that occurred during the 1782 Revolutionary War Timeline include the Battle at Combahee River. The Revolutionary War Timeline is divided into separate sections for easy reference. This section of the Revolutionary War Timeline marks the end of the war on April 11, 1783. December 23, 1783 Washington resigns his commission as commander-in-chief to the Congress of the Confederation. January 14, 1784 The Treaty of Paris is ratified by Congress and the American Revolutionary War officially ends. 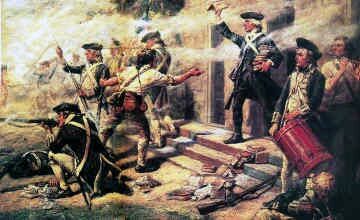 Discover interesting information and facts about American history via the Revolutionary War Timeline. This Revolutionary War Timeline provides a list detailing key events and dates of this amazing period in history. We have compiled a comprehensive Revolutionary War Timeline which provides a chronological list detailing the battles and conflicts in date order that were fought against the British in the American War of Independence. The Revolutionary War Timeline is the fastest and easiest way to gain a full overview of the history of America via the Revolutionary War Timeline.